7Solutions India is one of the best economical rebar detailing services providers for reinforcing bar bending schedule and estimation. We are providing state of the art bar bending schedules, rebar detailing services and rebar drawings services to structural engineers, fabricators, steel erectors, structural steel detailers, designers and general contractors. 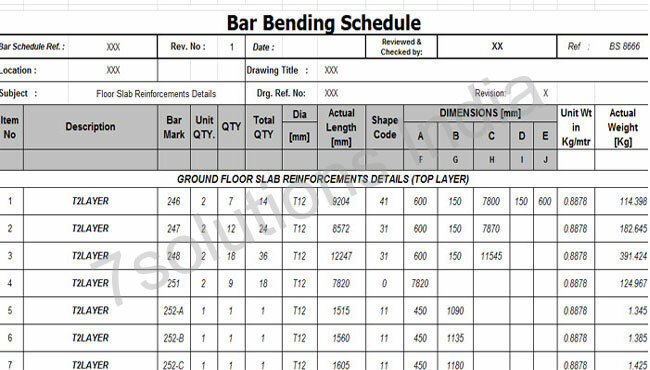 Bar bending schedule or diagram is the extended presentation of cut and bend bars as per the design requirements of reinforcement detailer. It is a list of reinforcing for the works to be carried out, it lists location of the bar, bar mark, diameter of bar, number of pieces, length before bending, shape code and various lengths of the bent shape and it gives perfect idea to the maker where to bend it. As per the schedule along with the steel drawings, the workers can install the steel correctly. Bar bending schedule is also defined as the previous estimation of quantity of reinforcement. 7Solutions India have already prove our reputation for quality has been achieved through our ability to manage and deliver projects in an efficient and cost effective way with in the ever changing construction industry. 7Solutions India has some of the expert detailers and professionals working with us. We are also organizing in house training programmers which train our expert rebar detailers as and when require. Of course, that is the reason we are known for producing expert and professional detailers in the industry. Our rebar detailers are committed towards the work and trained enough to produce error free results at low cost. Contact Us or Email: info@7solutionsindia.com to get more details about our low price bar bending schedules services and drawings.